Jean McKeown is a Vice President of Community Impact at the Community Foundation. In this role, she is responsible for the overall strategy and operational management of grant making and the leadership initiatives designed to promote the Community Foundation’s goals of advancing education, racial/ethnic equity, architecture and arts and culture. Jean oversees competitive and fee-for-service grant activities, scholarship programs and special funding projects which award more than $15 million annually. She also provides expertise and technical assistance to nonprofit organizations, conducts site visits to applicant organizations and evaluates the post-award performance of grant recipients. 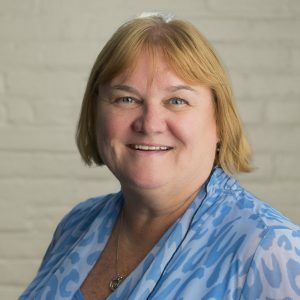 With more than two decades of experience working at the Community Foundation, Jean has seen the organization grow from a staff of three to a staff of more than thirty that awards more in grants in a month than it did in a year back in 1997. She was instrumental in developing the Community Foundations first Strategic Plan in 2006 and establishing the Community Foundation’s first Community Goals which have evolved into today’s leadership initiatives. Jean also helped expand grant making opportunities, including introducing fee-for-service grant activities which continue to grow. She administers grants awarded by the Buffalo & Erie County Greenway Fund Standing Committee, which works to connect people to the region’s green space, waterways and trails, and she administered the Fund for the Arts, which convenes Western New York patrons of the arts to strengthen art and culture in the region. Prior to her work at the Community Foundation, Jean worked for more than fifteen years at Roswell Park Cancer Institute, now the Roswell Park Comprehensive Cancer Center, where she coordinated the planning and implementation of a $100 million modernization project. Previously, she worked at the State University of New York at Buffalo Research Foundation where she worked on what later became groundbreaking medical research on Multiple Sclerosis. She received her B.S. in Business, Management and Economics from State University of New York Empire State College.